BH just yesterday another person was swallowed alive - as the earth opened its mouth to swallow him (in China). As previously posted we learn in the prophets that the Holy One Blessed He brings calamity on the nations as a warning for us,to take heed and mend our ways. Sometimes it might be difficult to understand the message, but in this case it is quite obvious and clear - in the Torah we learn that Korach opposed the absolute supremacy of Moshe Rabbainu, Korach claimed that the are plenty of other tzadikim... as a result HY had the earth open its mouth and swallow him. HY warns us in the Torah that never should anyone do as Korach.. . 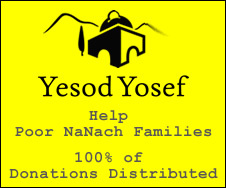 Thus it is imperative for us to learn this lesson well and fast,we must give our complete loyalty to Na Nach Nachma Nachman MeUman and not pay any interest to any of the rabbis G-d forbid. I don't quite understand this. There are NaNach rabbis...how about them? What does it really mean not to pay any interest to any of the rabbis? Which rabbis? I confess this puzzles me a little bit. Let's say you want the "honor" of studying Likutey Moharan forever in hell..since that is what Korach does (wishes he could do) scream about Moses is truth and his Torah is truth. Don't fool yourself, there is nothing more PAINFUL then studying Likutey Moharan with someone who is a 100% Apikorsos and Shakrane it's is such an insult to the sage that it is unbearable. Worse then the fires of hell is this type of "learning". Rabbi Natan has great mercy and he claims that he can come down to hell and study-- and if he does that, the angels will come down there too... So with Breslev there is ALWAYSE hope! HH mr. anonymous please read up about this subject in previous posts on nanach.net. basically the loyal tradition of Breslov after the passing of Rabbainu was that no one can take authority, we are all equal, if someone is more knowledgeable or talented or whatever so then he will help out the others just as a big brother, but not in any way that elevates his status.